Will #JazzFest 2016 changes help the crowd situation? The New Orleans Jazz and Heritage Foundation announced some changes for the 2016 edition of Da Fest they hope will improve the flow of people around the infield of the New Orleans Fair Grounds. 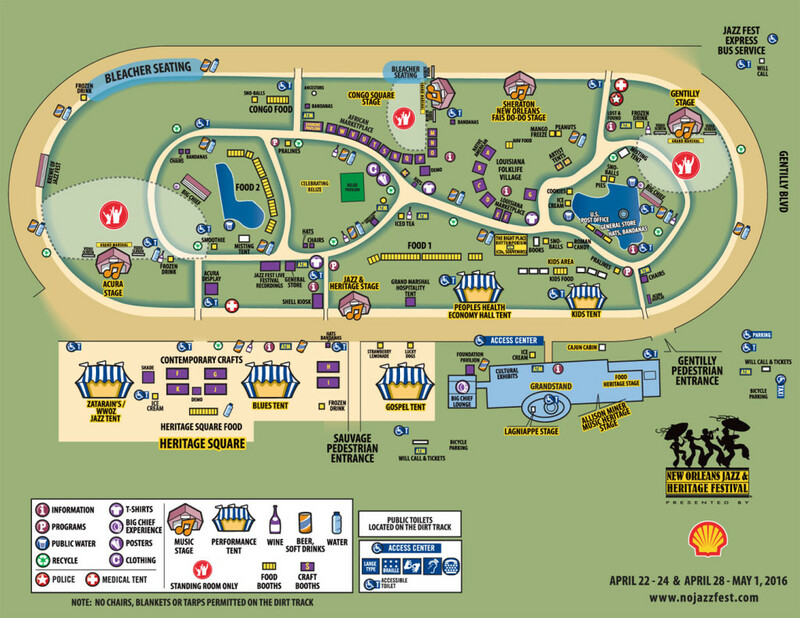 As the map above shows, the “Standing Room Only” sections at the big stages on either end of the infield, Gentilly and Acura, have been pushed further back, meaning those who want to camp out for the day will be further back from the stage. They’re also setting up bleacher seating towards the back of the area for each stage. These are good additions, so long as the SRO area is actually enforced. I don’t see where banning “camping out” on the track makes much of a difference, other than to create the impression they’ve banned chairs/blankets/tarps at the stages, and they hope folks won’t read the fine print.